The Best Food & Drink in Lisbon, Portugal — Blake Erik. Portugal has a long culinary history steeped in using fresh ingredients, maximising flavour (either on the sweet or savoury end of the spectrum), spices from its former colonies, alongside many Mediterranean influences. For years, Portuguese cuisine has been overlooked in favour of its more famous European and Mediteranean neighbours, but Portugal is fast becoming an important culinary destination, and there's no better concentration of great restaurants than in Portugal's capital of Lisbon, a port city that has been open to trade, discovery and exploration. In this guide, I'm aiming to cover a decent variety of food, from traditional Portuguese restaurants where you'll rub shoulders with locals; cuisine from other parts of the world; food markets and halls with a variety of stalls on offer; rooftop bars; small cafes and atmospheric restaurants. 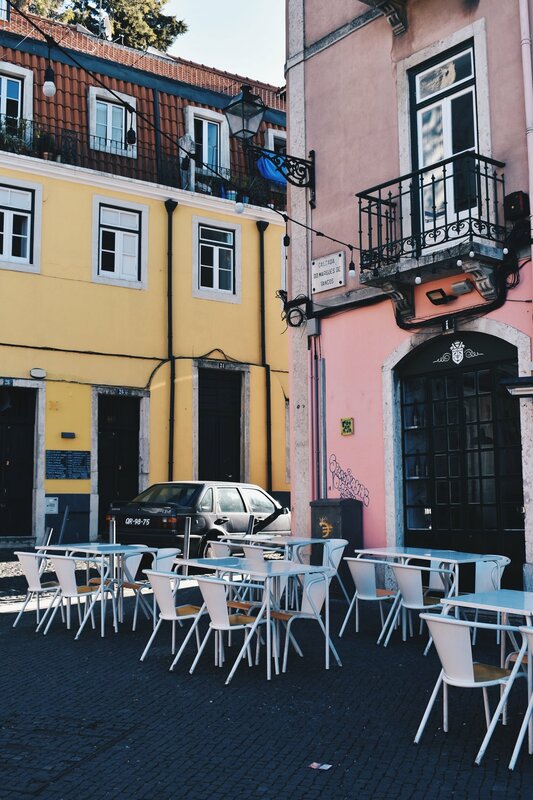 This restaurant tucked away in a little street corner is one of Lisbon's most popular joints, where you'll most likely be rubbing shoulders with locals, after waiting for a table of course. Even on a weekday in the winter, we waited a not unreasonable 10 to 15 minutes for a table. The restaurant is small but bustling. 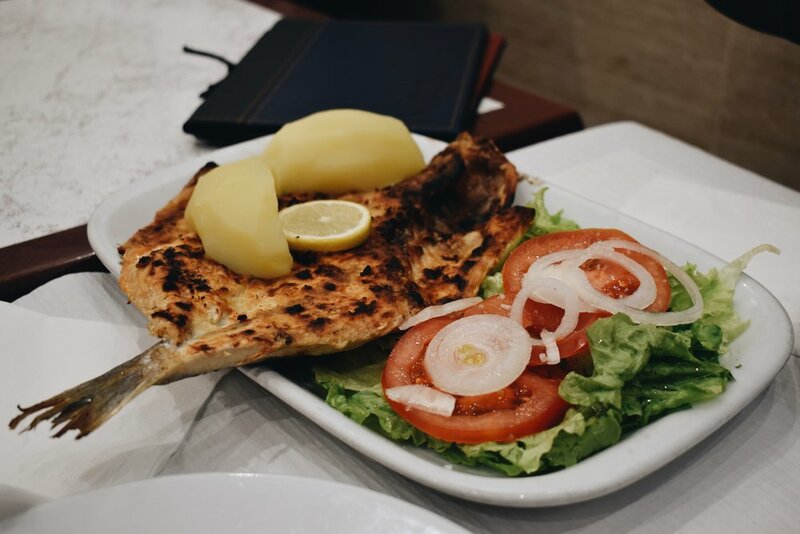 Portugal's cuisine is mainly based on fresh seafood and meat, grilled or fried and that's exactly what we went for on the menu. As with most Portuguese dishes, each plate is a pretty decent size, and if you're a group of anywhere beyond an individual, it's far better to share, and most of these places are built for sharing anyway! Each plate which had a generous serving of fries/rice/salad clocked in €10 and under, making for an incredible value-for-money meal (like with most traditional Portuguese food). This literal hole-in-the-wall restaurant is located in the old Moorish neighbourhood of Mouraria, hence the name of the restaurant, in the old quarter of Alfama. Getting to the restaurant requires navigating tiny, narrow cobblestoned streets off side streets and alleys. Busy for both lunch and dinner, this restaurant is so old school it doesn't even have a menu! Hanging up on the wall will be the week's specials (in Portuguese of course), but you can order other items from the kitchen as well, just talk to your waiter! If you'll be here for dinner, it's recommended that you get in the moment they open to put your name down for a table. Given that it was still a squeeze to get us in on a weekday lunch, I can only imagine what the summer must be like, and/or on the weekends. With this, we're heading into fast food / casual dining, but this humble store is CROWDED. Pão Pão Queijo Queijo (which literally translates to bread bread cheese cheese), is a busy store where you order with the friendly staff at the cashier and head to the counter to collect your food. These guys will whip up your sandwiches, salads, and mixed grill plates in a jiffy as they call for your order number in Portuguese (the numbers are displayed on the counter too so don't worry if your Portuguese is lacking). Seats can be found outside the store or upstairs, but this place gets incredibly packed because it's on the main street in the district of Belém, and is a stone's throw away from St. Jerome's Monastery which is one of Belém's premier attractions, and just down the road from Pastéis de Belém, the most popular and original store for Portugal's famed pastéis de nata (but more on Pastéis de Belém below), so finding a seat can be a struggle. The place was fully occupied (again, on a weekday in the winter), so be prepared to wait or takeaway from the counter! What started life as Mercado da Ribeira, Lisbon's largest and oldest food market, was transformed in May 2014 and opened as a Time Out market, the first of several planned food halls. With added marketing and promotion from Time Out, this market received a staggering number of 3.1 million visitors in 2016 alone, and has become one of Lisbon's hottest places for food & drink. With more than 40 stalls, almost all of the city's tastebuds are represented here in the form of burgers, pizza, pastries, seafood, Asian, steak, Portuguese etc. As we were travelling in a group, we managed to try food from a few stalls, and my favourite was Alexandre Silva, a native of Portugal who fused his own creativity with traditional Portuguese dishes, and won Portugal's first televised Top Chef competition. I also enjoyed Honorato, Lisbon's premier gourmet burger chain, started by Márcio Augusto Honorato who cooked up his own personal recipe for these incredibly tasty burgers! Located in the neighbourhood this market is named after, Campo de Ourique is located further north of Lisbon's downtown, making this market a less popular one than Time Out Market above, which is located at Cais de Sodre, a hip neighbourhood right on the waters of the Tagus River, and a major transport hub interchange. If I'm being honest though, I liked the vibe of this market just as much, if not more than it's more popular counterpart. Lisbon's hardly a sprawling city anyway, so a 15 minute tram ride and 5 to 10 minute walk from the tram stop through the neighbourhood’s streets brought us to the market. Here, it feels more like an actual market, with many bakeries, fruit, ham etc. market stalls rubbing shoulders with food vendors. The seating area is also gathered in the middle, but capacity is definitely a fraction of Time Out Market's. Still, we had no trouble finding a seat amongst the sea of locals and a handful of tourists in-the-know. It was here that I had the best steak in Lisbon (for the same amount of money anyway), a full plate of Dry Aged Rib Eye for a mere €13 at a stall called Atalho. It was tender and juicy, served with a side of wedges that were seasoned really well, and I opted for a basil sauce which complemented my steak perfectly. Other foods we tried included shrimp curry rice (Malha Marisqueira seafood stall), carbonara (Al Dente Italian stall), sashimi (Tasca Japonesa sushi stall), steak sandwiches as well as steak from another stall (Cortesia stall specialising in entrecôte). Of course, even though Portuguese food in humble taverns often come in huge helpings with humble price tags, Lisbon doesn't suffer when it comes to swankier affairs. Lisbon's (and Portugal's) culinary scene is starting to take shape in the form of chefs from Portugal who have worked stints in Michelin-starred restaurants and returned to head their own, where some have even earned theirs! Of course, in this section, I'm not actually looking at restaurants north of €20, because I really do think you can have a very great meal in Portugal and many other parts of Europe for that price, so that'll be the upper cut off here. Set in a cosy hostel off the main streets of Baixa-Chiado is The Decadente Restaurant & Bar, with an indoor and outdoor patio option for seating. On the menu is modern Portuguese fare, so you'll find beautifully plated seafood and meat dishes for mains. The best thing about this restaurant (apart from the fact it was open on Christmas Day for dinner when it looked like we might've been forced to have average food due to the lack of options), is that prices honestly aren't unreasonable. Each main falls somewhere below €20 so feel free to indulge in the starters, drinks and desserts. The grand bar is located in the outdoor patio, and certainly had a plethora of options. Located in the heart of Lisbon's cool industrial space LX Factory, this gastropub offers a stunning rooftop seating area, a prime location to watch the sun go down on the river complete with views of the Ponte 25 de Abril bridge and National Sanctuary of Jesus Christ statue (reminiscent of Christ the Redeemer in Rio de Janeiro, Brazil). Entering the gastronomic bar (you'll have to take a lift up), you're greeted by a multitude of bright colours and lights, board games and table games in front of the bar, which is located next to a live stage. For a proper meal, you will head to the seated area and tables run out quick given that Rio Maravilha is one of Lisbon's premier rooftop bars, as well as LX Factory's most popular restaurant by a country mile. Food here was brilliant, but order some starters to really fill up. I'm quite literally adding a whole category of Mexican for the sole purpose of adding this restaurant to the proceedings. With the goal of spreading the love for Mexican street food to Lisbon, these guys have definitely done it as there's a waiting list just about every night as hungry patrons gather outside the doors to wait for a table. We ordered a whole bunch to share from beef to pork to chicken to fish to shrimp tacos, and they were SO good. Incredibly flavourful at around €5 a plate, this is a place that invites groups to share, and the lively atmosphere only adds to this. Well that, and the cocktail menu. This was one of my top meals in Lisbon, and the one I wanted to go back to the most. Alongside Cristiano Ronaldo, Pastéis de Nata is probably Portugal's most famous export. Located in the district of Belém, it's said that this shop in this neighbourhood is where it all started, the OG pastéis de nata if you will, one that started all those years back in 1837. The recipe used here is the one cooked up in Mosteiro dos Jerónimos, recreated everyday by hand in their bakery. This really is the best one we got to try in Lisbon out of three stores we tried, mainly because it was miraculously able to remain warm until we finished the tart, quite the achievement in winter when the others we tried lost all their warmth and crisp by the second bite. Was that part of the recipe? I'll have to ask the monks. The base of the tart is also the crispiest out of all the ones we tried, making each bite one you really, genuinely savour. A counter exists for takeaway, which many do, which leads to quite the line. Manageable in winter if you get there slightly earlier in the morning, but I shudder just thinking of summer queues. Even the 400-seating capacity inside the shop fills pretty quickly as people wait for tables, which should lead you on to just how popular of an institution this is. And it's not all tourists either, even though it could very well have become a tourist trap, you'll be hearing the chatter of the typical Portuguese sing-song lilt reverberating all throughout the shop. Other pastries are available too, from sandwiches to croissants, but you know what you came here for. Another highly rated shop selling these favourites is Manteigaria, where you'll too be able to see the chefs making the pastries behind a glass panel while you enjoy your tarts. Mind, there is no option for seating here so you'll have to stand at the bar or take away, so we chose the latter. Honestly though? I would still choose Belém's over this for the simple fact the base was crispier and it stayed warm for a longer time. Don't worry though, tarts just like these are sold everywhere, from the brandless to the branded, from airports to residential neighbourhoods, you can try them everywhere and decide for yourself which you feel is the best! If chocolates and cakes are more your thing, and you find yourself in LX Factory, do drop by Oh! Brigadeiro, a cafe repping the Brazilian delicacy of (surprise) brigadeiro, made with condensed milk, butter, and cocoa powder, coated with a layer of chocolate sprinkles on the outside. I opted for the dark chocolate options to not have it too sweet, but it was my first time giving it a try and thought it was really good. Even the brigadeiro cakes are pretty well done, and none were too much for the palette. Wash it down with a cup of coffee or tea!